Last month, 41 Mercedes-Benz B-Class Electric Drive hatchbacks were delivered to their owners, marking the first month of sales for the first battery-electric vehicle from the German luxury maker. The official first buyer, Kim Price, lives south of Los Angeles in Mission Viego; she's been a Mercedes driver for 15 years. Last year, Price took a new job as vice president of operations at PetHead, a pet-care products company in West Hollywood--requiring her to drive 70 miles each way, four days a week. "I knew I needed a new way to commute," Price told Green Car Reports. "I'm not only concerned about the carbon footprint of all that commuting, but, hey, there's this HOV-Lane access" granted to plug-in vehicles with only a single occupant. Last year, Price visited her Mercedes-Benz dealer to inquire about plug-in vehicles--and found there were none available at the time. She looked at a Tesla Model S as well, but while she liked the car, "it was just out of my price point" at a starting price of $69,900. So Price leased a 2014 Honda Accord Plug-In Hybrid sedan and obtained the "green sticker" giving her access to the carpool lanes on the San Diego Freeway (Interstate 405). "I hadn't had a Honda since I was a teenager," she said, "but it was affordable and could hold my family--the Nissan Leaf and the Chevy Volt were a little too small." 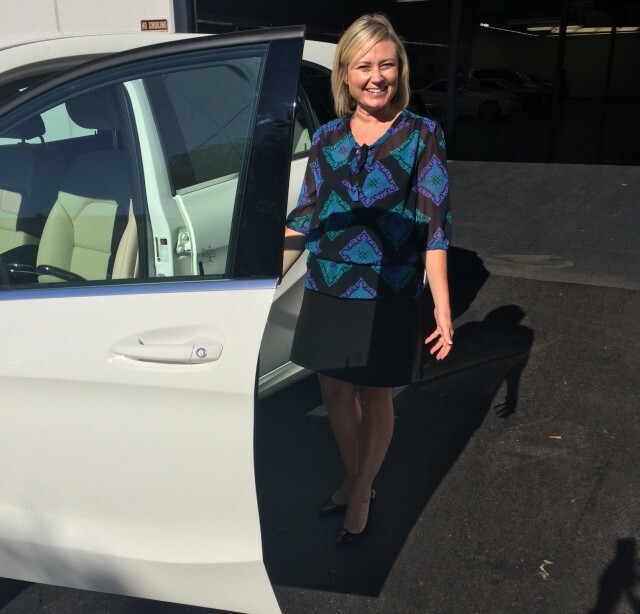 She drove the Honda for eight months, but "kept looking for any other luxury cars that had a [plug-in] hybrid." 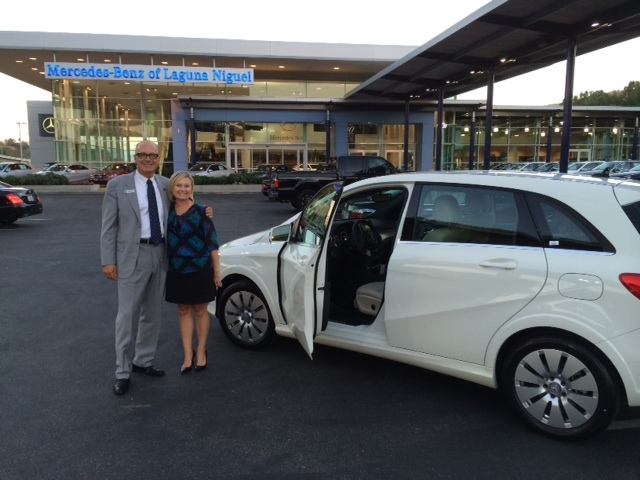 Price happened to be in Germany the month before the electric B-Class was officially introduced in the U.S.
"I liked the looks, it was big inside," it had the luxury Price wanted--"so I called Mercedes-Benz of Laguna Niguel and put down a deposit." Now that Price has been commuting in her B-Class for a month, she says, "It fits my needs." "It's all electric, and though there's a capacity of 85 miles on a single charge, that's a very conservative estimate in my experience." Her daily commute traffic ranges from cruising at 75 mph to stop-and-go traffic on the freeway, so access to the carpool lane is hugely important--as California commuters know all too well. With its regenerative braking and the radar-based adaptive cruise control, Price finds that driving the 70 miles to work--and starting with an indicated 85-mile range--she often has an indicated 35 miles of charge remaining. The parking garage in the Sunset Boulevard building where Price works has six 240-Volt Level 2 charging stations. 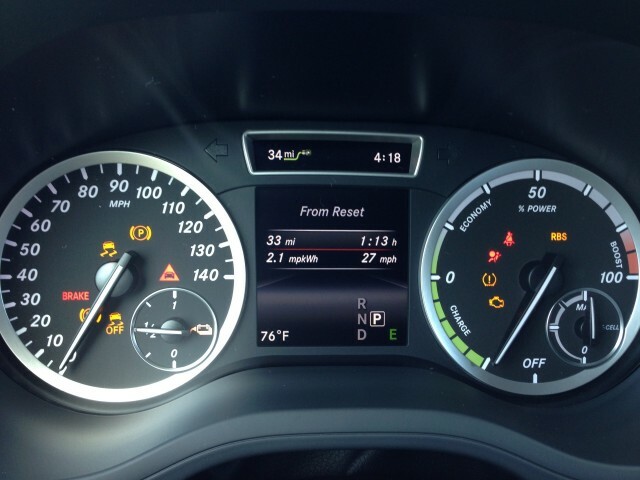 She notes that the smartphone app for her B-Class alerts her when the car has finished recharging--"typically about three hours," she says. At that point, she'll move the car to a non-charging space or, she admits, often call the valet service in the garage and have them move it, to open up the charging station for another user. 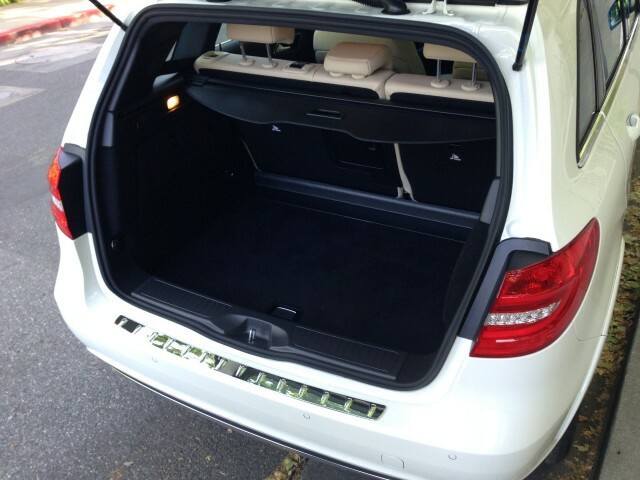 The most pleasant surprise of her B-Class has been the high range, Price said. "I'm super-excited" at not having to "squeak by with 5 miles" to spare when she arrives at work. She also likes "having my trunk back," given the reduced trunk volume of her plug-in Accord to accommodate the battery pack. On the downside, she was surprised to learn that her 2014 B-Class didn't come with Apple CarPlay, announced for the new 2015 C-Class models. "Plug-in geeks like technology, or at least I do," said Price. "I want the latest and greatest, so it was kind of a bummer" not to have CarPlay in her electric car. She would also have liked a sunroof option. Finally, Price likes the fact that her Mercedes-Benz B-Class isn't that common a sight on the streets of Southern California. "Heads turn," she said, "and I get people asking, 'What IS that?' all the time."